“The former prison director explained to me that this issue was not important enough to deserve my attention,” said Krakow prison administrator Zygmunt Lizak to local daily Gazeta Krakowska. Polish and Romanian producers have come together in this film to bluntly explain what was important enough to deserve his attention – the death of Claudiu Crulic. Droga na drugą stronę recounts the deadly hunger strike undertaken by a 33-year-old Romanian citizen wrongfully accused of theft in Krakow while travelling by bus to Italy. Romanian cinéaste Anca Damian proves that animated documentaries should be regarded as a genre in their own right. 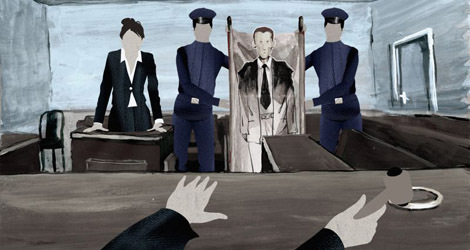 From a technical point of view, Damian’s feature has more in common with the graphic journalism of Lebanese-Swiss cartoonist Chappatte than the genre’s landmark Waltz with Bashir (2008) directed by Ari Folman. Unlike Folman’s work, which is drawn, Damian has integrated images of real objects into the narrative using decoupage, drawing and collage to boost the distancing effect. Dipped in a peculiar form of black humour à la Lucian Pintilie, which is indeed more Romanian than Polish, Droga na drugą stronę provokes the viewer with a set of anguished questions about Crulic’s ordeal. As in Waltz with Bashir, the director eventually jolts the viewer back to reality with the abrupt insertion of real footage in the epilogue. Damian’s second full-length feature has, deservedly, been cherished across Europe. The ‘river movie’ genre may already have had its moment of glory with the Golden Lion winning Chinese masterpiece Still Life (2006) set along the banks of the Yangtze. 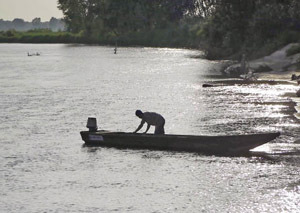 Apparently, a smooth mix of fiction and documentary shot beside a river has become a recipe for critical acclaim at film festivals. Unfortunately, the Vistula is six times shorter than the Yangtze and the disproportion between the budget of Wszystko płynie (2011) and Jia Zhangke’s masterpiece is even more extreme. A seasoned volunteer at the sole lifeguard station on the Vistula claims that the Poles have turned their back on the Vistula, but Piotr Ivan Ivanov and Krzysztof Dziomdziora seem content to wander its length uncritically. Filmed with dexterity by Jan Prosiński this fluvial ode doesn’t feature too much political pamphleteering about environmental issues. As the original title suggests ‘everything flows’ for an amateur boatman who navigates only for the pleasure of the experience. Despite the fact that the fictional fragments do not always harmonise with the travel footage, the whole is nicely cemented together by a classy indie-folk soundtrack. The melancholic tunes of Polish breakthrough artists such as Adam Repucha and Paula & Karol help and enhance the viewer’s journey through each scene. As a collage of visual impressions patiently assembled over two years, Wszystko płynie may entice lovers of the documentary. With the return of Leonardo da Vinci’s Lady with an Ermine to Krakow, local art lovers are eagerly awaiting a glimpse after her long, long trip abroad. In the meantime, catch Vinci – a thriller that puts the famed work centre stage as the target of master criminals. Vinci is less a crime-comedy and more a heist movie with a sense of humour. The picture could have turned out formulaic under the guidance of a lesser director, but Juliusz Machulski has struck a rare balance between realistic dialogue and entertaining banter between his stars. He uses Krakow as a fitting backdrop for an elaborate plan to steal the city’s greatest work of art. Robert Więckiewicz, a frequent collaborator with Machulski, delivers an understated performance as Cuma – a career criminal recently released from prison on fabricated claims of ill health. His motive all along is to steal the cherished painting. Cuma’s partner, Julian, played by Borys Szyc, has joined the police during Cuma’s prison term, and is torn about joining his old friend for the job. 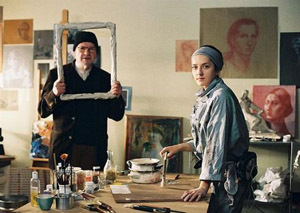 Kamila Baar plays Magda, a savvy art forger recruited by the two conmen, but unaware of their true intentions. The director’s father, Jan Machulski, gives a compelling performance as Tadeusz Hagen – Magda’s grandfather and mentor. While most of the plot is focused on the team’s intricate set-up, almost all of the suspense is reserved for the film’s climax. The ending is something of a twist, although keen viewers might be able to see it coming. In general, Vinci is a worthwhile picture representative of the growing stature of contemporary Polish cinema.